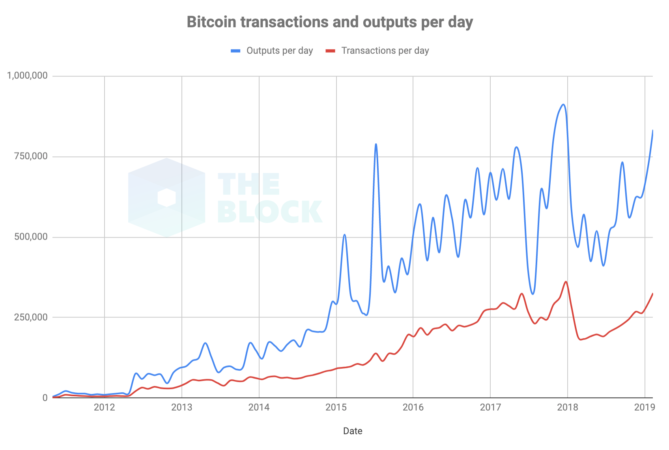 The number of Bitcoin transactions per day averaged on the monthly basis has reached a one-year high of 326,000. Last time when the number of transactions was this high was in December 2017 at the height of the speculative mania. Additionally, because it is encouraged to batch several outputs into one transaction, using the number of transactions could skew the actual activity. The majority of large exchanges and wallet providers have implemented batching since it's one of the most efficient methods to reduce transaction fees. Therefore, the number of outputs per day was also examined. Similarly, the number of outputs per day averaged on the monthly basis has reached a one-year high of 833,000. The uptick in on-chain activity is apparent from the chart below.